Stamens inserted round the disk or sometimes on the disk, as many as or twice as many as the petals or numerous; anthers dorsifixed or basifixed, usually all fertile in ? Pell, S.K. (2009). Neotropical Anacardiaceae. 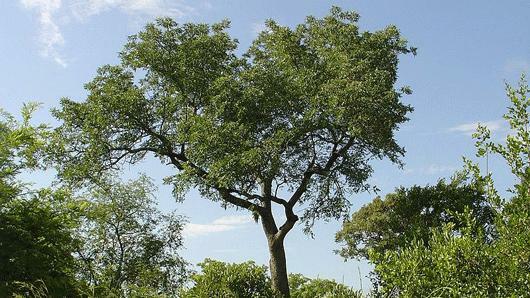 Trees, shrubs, rarely subshrubs or lianas, frequently with contact dermatitis-causing exudate . Vertical resin canals present in bark and in phloem of petioles and large veins of leaves, also widely present in fruits, flowers, and other tissues. Leaves simple or pinnately compound ; alternate , rarely opposite or whorled ; sessile or petiolate ; leaflets opposite, subopposite, or alternate , entire , serrate , dentate , or crenate ; estipulate. Inflorescences terminal and/or axillary , thyrsoid, paniculate, racemose, or spicate; rarely flowers solitary. Flowers actinomorphic , unisexual or bisexual ; plants dioecious , monoecious , andromonoecious, polygamous, or hermaphrodite ; pedicels often articulate ; hypanthium sometimes present; perianth usually 2- whorled , rarely 1- whorled or absent, imbricate or valvate ; sepals (3-)4-5, usually basally fused, rarely fully connate and cup-shaped; petals (3-)4-5(-8), rarely absent; stamens (1-)5-10, in 1 or 2 (rarely more) whorls, in some genera only 1 or 2 stamens fertile, filaments free , rarely basally connate , anthers dorsi- or basifixed, usually longitudinally dehiscent , introrse, rarely extrorse; disc intra-staminal, rarely extra-staminal or absent; ovary superior , rarely inferior, solitary or of 2-5 connate carpels, ovule solitary, apotropous, basal , apical, or lateral , style apical or lateral , erect or recurved , rarely sigmoid , stigma capitate , discoid , lobate, or spathulate , rarely punctiform. Fruits drupes or samaras (rarely syncarps, utricles, nut -like, or baccates), fleshy or dry, occasionally subtended by a fleshy hypocarp or an accrescent , chartaceous or fleshy calyx ; mesocarp sometimes with prominent black resin canals. Seeds 1-5; endosperm scant or absent; embryo curved or straight (rarely horseshoe-shaped or pyramidal), cotyledons usually planoconvex or flat and free , usually equal in size, rarely fused or ruminate , sometimes bilobed. Pell and Mitchell split the family into two subfamilies, Anacardioideae and Spondioideae (Mitchell et al. 2007). However, recent phylogenetic evidence (Pell unpublished data) suggests that subfamily Spondioideae may be polyphyletic. Mangiferaindica L. has naturalized throughout the Neotropics. 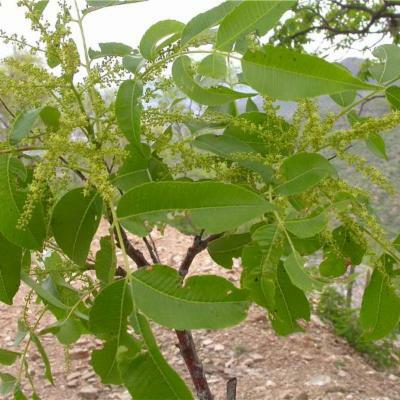 Toxicodendronsuccedaneum (L.) Kuntze has naturalized in Brazil and possibly elsewhere. Several non-native Anacardiaceae are cultivated in the Neotropics for their edible fruits: Bouea macrophylla Griff., Harpephyllum caffrum Bernh. ex Krauss, Mangifera indica, Schinus terebinthifolia Raddi, Sclerocarya birrea Hochst. subspecies caffra (Sond.) Kokwaro, and Spondias dulcis G.Forst.. There are 81 (see list above) genera of Anacardiaceae and ca. 800 species worldwide, of which 31 are native to the Neotropics. Attilaea E.Martínez & Ramos, a recently published genus endemic to the Yucatan peninsula of Mexico, is not included in this list due to a lack of accessible material. Naturalized Mangifera L. is not listed because it is not native to the Neotropics. Actinocheita F.A.Barkley - endemic to south-central Mexico. Amphipterygium Schiede ex Standl. - western Mexico to northwestern Costa Rica. Anacardium L. - Honduras to Paraguay, Brazil and Bolivia. Antrocaryon Pierre - Amazonian Brazil (also found in Africa). Apterokarpos Rizzini - endemic to the Caatinga of northeastern Brazil. Astronium Jacq. - Mexico to Paraguay and northern Argentina. Bonetiella Rzed. - northern to central Mexico. Campnosperma Thwaites - Honduras to Ecuador and Amazonia (also found in the paleotropics). 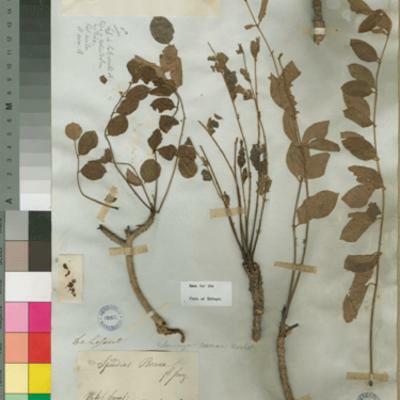 Cardenasiodendron F.A.Barkley - endemic to Bolivia. Comocladia P.Browne - central Mexico to Guatemala, Belize and the Greater and Lesser Antilles. 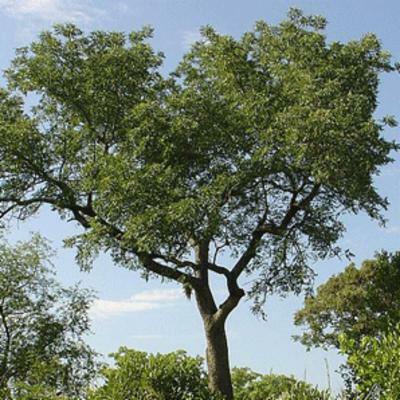 Cyrtocarpa Kunth - southern Baja California, Mexico, and Colombia east to Guyana, Venezuela and northern Brazil. Haplorhus Engl. - endemic to the dry inter-Andean valleys of Peru to northern Chile. Lithrea Hook. - Brazil, Bolivia, Paraguay, Argentina, Uruguay, and Chile. Loxopterygium Hook.f. - Venezuela to Argentina, absent from Amazonia. Malosma Engl. - southern California, USA to central Baja California, Mexico. Mauria Kunth - El Salvador to eastern Venezuela and northern Argentina. Metopium P.Browne - West Indies, southern Florida, USA, Mexico and northern Central America. Mosquitoxylum Krug & Urb. - Jamaica, and southern Mexico to northwestern Ecuador. Myracrodruon Allem. - sub -Amazonian Brazil, Bolivia, Paraguay, and northern Argentina. Ochoterenaea F.A.Barkley - Panama, Andean Venezuela and Colombia to Bolivia. Orthopterygium Hemsl. - endemic to western Peru. Pachycormus Coville - endemic to central Baja California, Mexico. 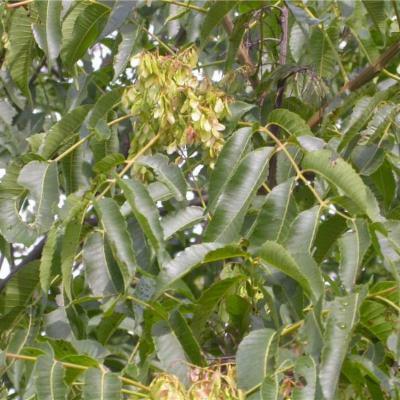 Pistacia L. - Texas, USA, to Nicaragua. Pseudosmodingium Engl. - endemic to central and southern Mexico. 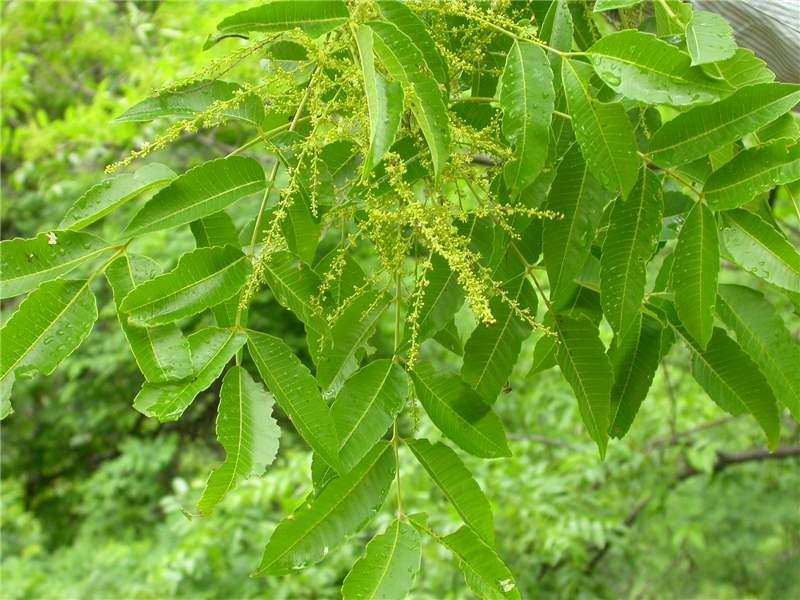 Rhus L. - southern Canada to Panama and Cuba (also found in Africa, Asia, and Europe). Schinopsis Engl. - northern Peru, sub -Amazonian and eastern Brazil south to central Argentina. Schinus L. - Ecuador to Patagonia, absent from Amazonia. Spondias L. - Mexico to Brazil and Bolivia (also found in Asia and the Pacific). Tapirira Aubl. - southern Mexico to Brazil, Bolivia and Paraguay. Thyrsodium Salzm. ex Benth. - Colombia, Peru, Bolivia, Venezuela, the Guianas, and Amazonian and eastern Brazil, absent from the Andes. Toxicodendron Mill. - southern Canada to Bolivia (also found in Asia). Anacardiaceae can be separated from Burseraceae by the latter virtually always having opposite leaflets, whereas Anacardiaceae leaflets are usually alternate or subopposite. Some genera cause contact dermatitis. If compound, usually imparipinnate; or if paripinnate, determinate. One apotropous ovule per locule. 9. Calyx deeply lobed; stylodia usually 3; exocarp generally separating from mesocarp at maturity, endocarp bony — Schinus p. p.
9. Calyx shallowly lobed; stylodia always 3; exocarp generally separating from mesocarp at maturity, endocarp chartaceous —Mauria p. p.
12. 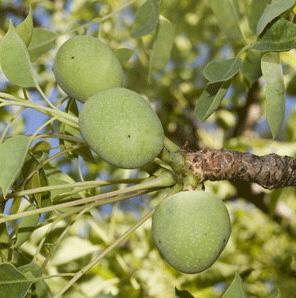 Exudate turning black with exposure to air, causes contact dermatitis; leaves entire; fruit a laterally winged samara; South America —Schinopsis p. p.
12. Exudate milky, nontoxic; leaves serrate; fruit a syncarp subtended by a wingedpeduncle; Mexico to Costa Rica —Amphipterygium p. p.
13. Leaves entire with marginal secondary vein; exocarp readily separating from mesocarp; mesocarp waxy and white with black resin canals; South America — Lithrea p. p.
15. Male flowers in pendent thyrses, female flowers tightly arranged & subtended by an involucre; fruit winged — Amphipterygium p. p.
16. Exudate absent; exocarp reddish with glandular trichomes and remaining attached to mesocarp, mesocarp not as above —Rhus subgenus Lobadium p. p.
17. Marginal secondary vein present; hairy tuftdomatia absent; androecium diplostemonous; South America — Lithrea p. p.
17. Marginal secondary vein absent; hairy tuftdomatia sometimes present in secondary vein axils abaxially; androecium haplostemonous; Mexico to Guatemala —Toxicodendron p. p.
23. Male inflorescence pendant and large; sepals 5-8, longer than stamens; Mexico to Costa Rica — Amphipterygium p. p.
28. Plants dioecious or monoecious; leaves usually evergreen; wing stiffened and thick, lacking conspicuous venation, consisting of exocarp and mesocarp tissue —Schinopsis p. p.
35. 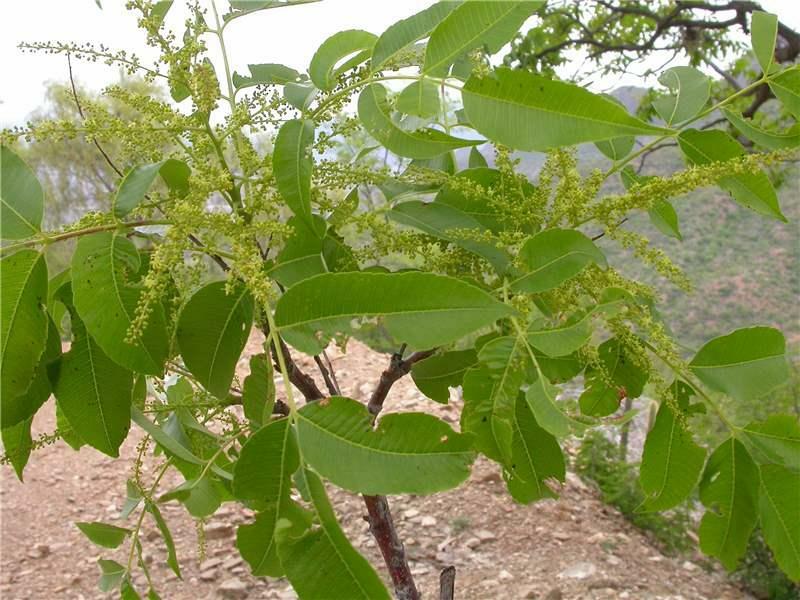 Plants polygamodioecious; leaves usually deciduous (rarely evergreen); stylodia 3; exocarp white to grey or yellow, easily separating from mesocarp; mesocarp white or gray with black resin canals — Toxicodendron p. p.
37. 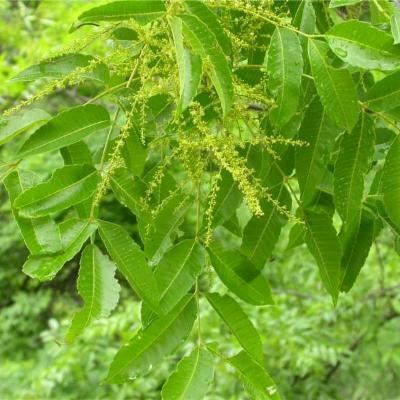 Erect or scandent shrubs or small trees (up to 7 m); fruit covered with glandular trichomes; seed fills most of the locule — Rhus p. p.
38. Leaflets with a prominentmarginal secondary vein; fruits pale grey to whitish — Lithrea p. p.
39. Leaflets petiolulate; corolla valvate or subvalvate; exocarp not easily separating from mesocarp at maturity — Mauria p. p.
39. Leaflets sessile to subsessile; corolla imbricate; exocarp easily separating from mesocarp at maturity —Schinus p. p.
Mitchell, J. D., and S. A. Mori. 1987. The cashew and its relatives (Anacardium: Anacardiaceae). Memoirs of the New York Botanical Garden 42: 1-76. Mitchell, J. D. 1990. The poisonous Anacardiaceae genera of the world. Advances in Economic Botany 8: 103-129. Mitchell, J. D. 2004. Anacardiaceae. In Smith, N., S. A. Mori, A. Henderson, D. W. Stevenson, and S. V. Heald (eds.) Flowering Plants of the Neotropics. pgs. 14-16, Princeton University Press, Princeton, NJ, USA. Pell, S. K., J. D. Mitchell, T. Lobova, and A. J. Miller. In press. Anacardiaceae. In K. Kubitzki (Ed. 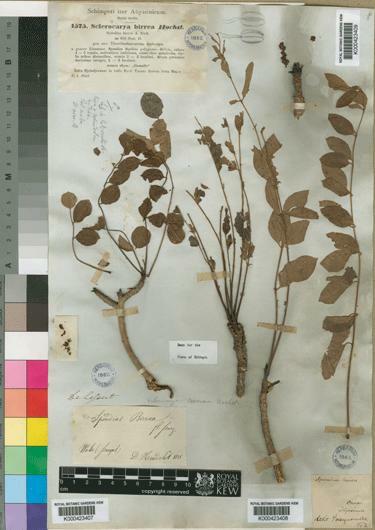 ), The Families and Genera of Vascular Plants. Springer. Ribeiro, J.E.L.S., Hopkins, M.J.G., Vicentini, A., Sothers, C.A., Costa, M.A.S., Brito, J.M., Souza, M.A.D., Martins, L.H.P., Lohmann, L.G., Assunção, P.A.C.L., Pereira, E.C., Silva, C.F., Mesquita, M.R. & Procópio, L.C. 1999. Flora da Reserva Ducke: Guia de identificação das plantas vasculares de uma floresta de terra firme na Amazônia Central. INPA, Manaus. 816 pp. Wannan, B. S., and C. Quinn. 1990. 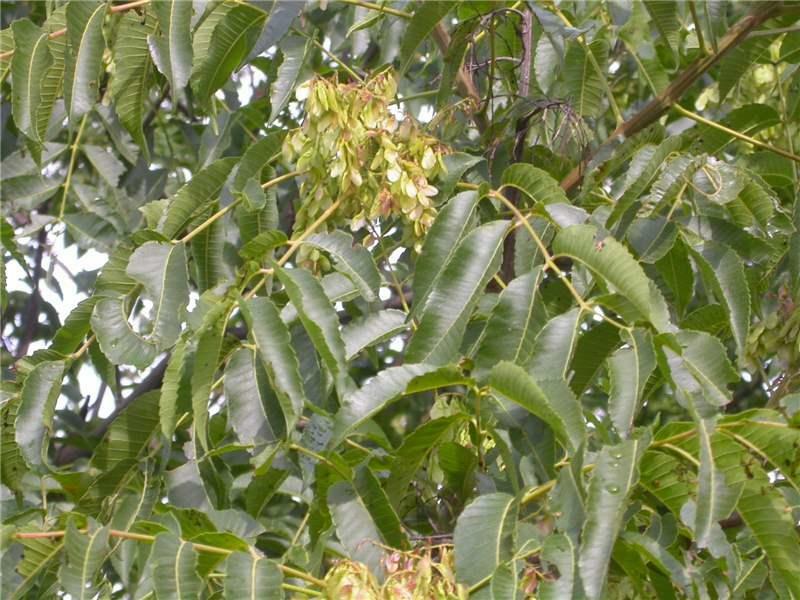 Pericarp structure and generic affinities in the Anacardiaceae. Botanical Journal of the Linnean Society 102: 225-252. Wannan, B. S., and C. Quinn. 1991. Floral structure and evolution in the Anacardiaceae. Botanical Journal of the Linnean Society 107: 349-85. Various Neotropical floras are important as well. These include, among others: Flora de Nicaragua, Guide to the Vascular Plants of Central French Guiana, Flora of Baja California, and Flora of the Venezuelan Guayana.